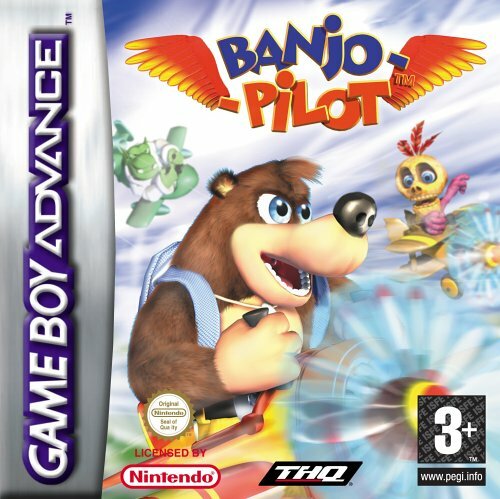 Banjo-Pilot is a kind of sequel to Diddy Kong Racing. It takes the aeroplane gameplay from the previous game and makes it the focus. So it’s a fun racing game, similar to the Mario Kart series, but where you only drive planes and not race karts. The game gives you the opportunity to play as Banjo, Kazooie, Mumbo Jumbo, Humba Wumba, a Jinjo, Klungo, Gruntilda, Bottles and Jolly Roger, though not all of them are immediately playable. I think it’s a nice selection of popular icons from the franchise and each of them gets their own unique plane too, which gives them all a little extra bit of character. All of the race tracks are based on locations from Banjo-Kazooie, Banjo-Tooie and Banjo-Kazooie: Grunty’s Revenge. I was quite pleased to see levels from Grunty’s Revenge included, as that game often gets overlooked, but really I was very happy with most of the stages as they provided a fond reminder of levels I’d enjoyed playing in the past. Here’s an oddity with the way the game plays. All of the race tracks are completely flat and could just as easily be raced on by conventional race karts. Even though you’re in a plane, if you go off the road and over the grass, you still slow down. It’s a bit weird, but I guess you just have to put it down to some kind of magic the characters are using to make sure people don’t cheat (and, in reality, technical limitations.) Some people see this as a negative of the game, but items are still in three dimensions, so it’s not like flying is completely wasted. Even though a lot of people don’t like this, I still find it just as enjoyable as either of the Mario Kart games done in this same style. Fans of the series, and indeed, fans of Rare in general, are likely to find a lot to enjoy about this game. As I mentioned, there are a selection of popular characters who are all full of personality and there are race tracks based on various locations from the main games. I was a little disappointed that Jamjars was not playable and that Mad Monster Mansion was not a race track, but these are minor issues. The race tracks are all full of fun little references too and a few characters make cameos in this capacity. Not only do you get Banjo-Kazooie characters like Gobi, but Sabreman (from the Sabre Wulf series) and Expresso the Ostrich (from Donkey Kong Country) also make appearances! I can’t help but feel very happy about this acknowledgement of the series’ connection to the Donkey Kong games. Overall, I think this is a great game and I think it’s a shame that it is remembered as being so mediocre. I enjoyed this game very much. Maybe it could have had a few more characters and it’s a shame that they didn’t come up with any kind of story (like Diddy Kong Racing had) but these are only really a few small ideas for improvements over what is already a fun game. There are lots of things to unlock and there’s a multiplayer mode too, so if you give Banjo-Pilot a chance, it’s sure to give you lots of hours of fun.